Character cottage in picturesque location. Property 9: Character cottage in picturesque location. Chocolate Box cottage. Relax and let the world go by. Property 13: Chocolate Box cottage. Relax and let the world go by. Property 15: Beautiful Gite just for two with free Wi-Fi, heated 8mx4m 'pool and garden. Gîte Sous le tilleul. With above ground swimming pool 5m x 3m from May 2019! Property 25: Gîte Sous le tilleul. With above ground swimming pool 5m x 3m from May 2019! Beautiful authentic house with large garden and equipped with modern comforts. Property 29: Beautiful authentic house with large garden and equipped with modern comforts. 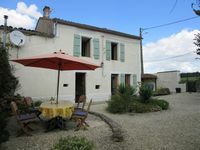 Property 37: GITE du MAINE du TILLEUL - Dinner offered on the day of arrival! A typical Charente long house painted cream with white shutters. Property 44: A typical Charente long house painted cream with white shutters. Clean, inviting, well-decorated and stocked apartment. We enjoyed our time near Coulgens. The gite is very clean and obviously stocked with items purchased specifically for its inhabitants. The plates, glasses, silverware, etc. are new and they match! To a person like me, that matters. One has no feeling that you're using the &quot;cast offs&quot; of someone's life. The kitchen has everything one can want. It was pleasant to cook in such a well-equipped space. The beds were comfortable and the bathroom is beautiful and I appreciated having two sinks. The garden area is also well-equipped for all one's needs. Clare and Chris were helpful with any information we needed. Having a large LeClerc shopping center in the area was a plus. We can recommend the mid-day &quot;plat du jour&quot; for relatively inexpensive eating that is tasty. If using a GPS that doesn't recognize Coulgens with the address, enter the town name St. Angeau, which will give you directions to the neighbors near.